Savenda General Insurance (SGI) has paid out almost US$280,000 in claims to Waka-Waka Ranch after the farm lost crops and property in a fire. SGI chief executive officer Irene Muyenga said a total of US$279,000 was given to the Mkushi-based ranch, which lost the wheat crop and equipment last November. Speaking during the hand-over of a cheque on Friday, Ms Muyenga said the development demonstrates the company’s commitment to paying out claims to cushion the impact of a calamity. 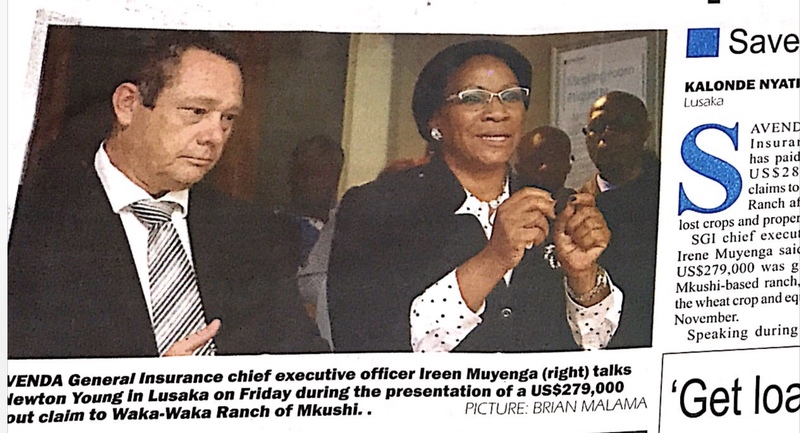 Ms Muyenga said SGI re-insured the policy for the ranch with a number of international companies.